Well, after a quick look at it, the graphic appears to be quite accurate. It's plenty sufficiently accurate, anyway, to debunk most of the claims made by CTers with only a reasonable bit of extra knowledge. I wonder if they even understand the full implications of what the graphic is telling them. Ie, that the CSV file cannot be raw bit data and the implied time stamps are not to be trusted. Seems odd that he'd post it if he actually understood it, as it tends to submarine alot of the assumptions made in analysis based on the CSV file. It would be interesting to know how much time is missing due to FDR destruction and data storing parameters. But with the video and data as is. The plane is only seconds from crashing into the ground and even if he points flight 77 into the pentagon as is and the approximate slope is 6 degrees, the altitude of flight 77 as it passes over the light posts, is only 90 to 120 feet above the base of the pentagon. Knowing how many seconds are missing from the final altitude would help, but flight 77 was in the door for hitting the pentagon as seen by the visual data from the NTSB of the FDR. It appears it was matched with the ground by approximation with other data. not sure how the ground was synchronized with the FDR data. They referenced the the FDR times to the ATC clocks. 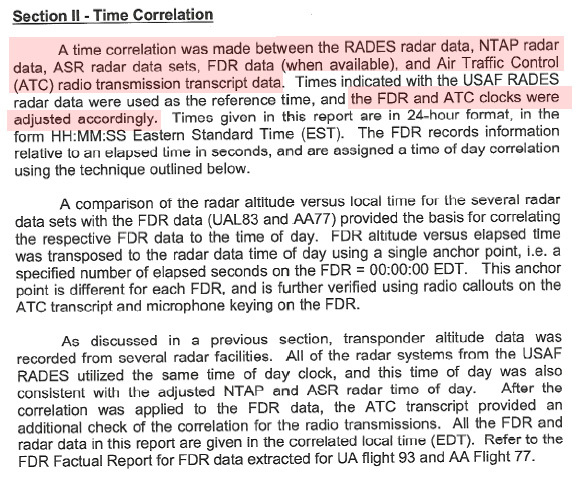 This was snipped from the "Radar Study From All 4 Flights - Time Correlation"
In case anyone is wondering, the onboard aircraft clock is handset, that is - it's not snyced to UTC. The DFDAU does indeed sample the clock, but I dont think its for event marking. There are also some parameters that weren't released in the CSV that might help, namely Radar Altimeter. Does anyone know if the raw file does have the RADALT data? I've seen people mentioning this file, but have not seen it linked yet. continues for every bit received. flight data. Refer to Figure 4 for an illustration of a 64wps frame structure. frame and subframe markers which define the frame structure of the data. After one full frame of markers has been verified, frame sync is declared. the SMP for storage in the CSMU. (d) Frame synchronized data is passed to the delta compressor module. delta values from frame to frame. of bits that can be packed together for efficient memory utilization. module counts packed data words in order to track 64-word “page” units. for transfer to the SMP using the TDM bus as it is completed. CSMU memory to validate storage. for impending memory write operations. Alot of PFM going on inside those block boxes! the excel file from NTSB does not have RADALT or other altitude besides PA I could find. I searched ALT and RADALT no joy. But the plane is only seconds away from impact, and if you back off at 6 degrees from the pentagon, it give you 6000 feet per minute, and it is only 90 to 120 feet above the base of the pentagon as it crosses the road. cargo plane' is just jargon in certain circles for any aircraft carrying over X gross weight. Whether it's bodies, boxes, or booty doesn't make a difference. It's all cargo. My apology for not noticing your explanation. I do hope we keep in mind that the "cargo" aboard flight 77 was priceless. The raw file was posted at JohnDoh's forum, but it's not exactly plain text. I believe the radar altimeter was listed under "parameters not working or unconfirmed" in the NTSB report (AAL77_fdr.pdf.) What they mean by that I do not know. Right, the CSV is an extraction from the raw FDR data, which was also released. The problem is the raw FDR data is useless w/o the frame-descriptor to describe how to decode it. I'm also growing more convinced that the raw FDR file is also compressed by a propriety system, which would make reverse engineering the frame descriptor impossible. Many of the parameters were "not working or unconfirmed". I should probably add up how many samples, total, occur during each frame in the CSV file and see how that total compares with the total bitrate, to see how much data got thrown out. The RADALT data wasn't included in the CSV file. This is because the government knows it will bust the case wide open if they release it! (oh wait.. that's JDX's line). 'cargo plane' is just jargon in certain circles for any aircraft carrying over X gross weight. Whether it's bodies, boxes, or booty doesn't make a difference. It's all cargo. No, sorry, I disagree with this assertion. Having worked in aviation for several years in "the old days", and having flown all over the world in the process, specifically with regard to shipping cargo, I do not accept this assertion. There was always a distinction made between shipping cargo and shipping pax. Granted, when talking about total weight on a particular flight, it might all be referred to as "cargo" but Under_Tow is over-simplifying if he wants you to believe that there was no distinction made between the two. Sheesh, the paperwork and manifests for cargo, particularly live cargo, were much more complicated and difficult than those for pax, in fact. Last edited by LashL; 22nd October 2006 at 12:02 AM. I was prepraded to discuss with AntiS there, until the LC rules kicked in. You should be commenting elsewhere or in a thread of a different subject. And, imo, you question has nothing to do with AA77 since you already know everything about it already. A giant cargo plane lumbered into the Nation's Capitial Airspace, took a nice lazy turn, and then flew unmolested into the HeadQuarters of the Nations Armed Forces. That is one heck of a security flaw that should not be revealed. Well, I want to be complete and don't want to just post some 'I know' statement. And, I'm not working on this full time. You know. I get on when I can and what not. And your post is a 5 page wall of text. HAHa, I could say the same thing about your "report". And I'm not making anything of great length, just making sure I only use source and not opinions. Also, I can't post links yet so that makes it kind of limited. I like this smilely jaw-dropping.gif but I can't use it b/c I don't have 50 posts yet. Hm. Maybe I post links with [code]. Nope that didn't work. Oh well that's just randy. And your referring to what? I need to work on my post count here. You report is tripe. It is so full of misunderstandings, misintterputations, and is total bloat. I can't believe your "waving it about as proof". I don't know why. The term 'computer expert' certainly could mean just about anything these days. Most likely because through my other work he's found me to be very adept with technology. In like terms, I don't care about your credentials much either, and I don't see why you even put them in your report, since they are pretty loose and easily typed by anyone. Perhaps to add a bit of extra fluff to the report maybe. And since you won't judge me by mine, I feel no reason to state them. I guess I have to get a couple hundred posts in before I can start acting like other Randi posters hey? I'd post the specific link. But I'm not allowed. But it is right below your question. That was it? He didn't seem to be having fun at all. I'm still waiting anxiously to see how he's going to use those graphics whose footnotes literally validate everything I've said. It is my current belief that the basic issues I bring up are yet to be understood by any of the "believers". I truly hope that is not true, because it will have meant I have wasted my time. They are going to attack a bunch of arguments that I'm not making (ie, quote that same line I've seen 5 times already about "perfect" data recovery), and declare victory. It's easier, I suppose, then having to learn how a complicated system works. The whole concept that the CSV file isn't the same as the raw FDR data completely escapes them, I think. What was that all about Gravy? Anyone can read through this thread for the progression of what I have (or haven't) done so far here. What are you trying to represent by just posting all my quotes completely out of refernece to everything around them? (the time I posted them, the comments before and after them, etc). Don't worry AntiS. You status and prestige with the JRandi site is not my concern. Niether is whatever battle you think your in. However, you may have more work to do editing your posts with the information I will provide you, since you failed to find it on your own. So on with the show. I will post my comments to your wall of text in sections, so it will be somewhat more readable. This is primarily my critque and not an alternative analysis (in which case I'm not going to be using any of your text anyway). I gathered up 1a all the publically available flight-data-recorder information, My initial intent was to 2a properly analyze the data and debunk the variety of 2b dopey conspiracy theories After reading 1b all of the NTSB reports, looking carefully at the data provided about the hardware, and the CSV file, I realized that virtually all conspiracy theorist attempts at 3 using this data for sub-second accurate reconstruction is completely and utterly baseless. 4 In the words of Pauli, paraphrased, they aren't even wrong. This details, specifically, what flight data recorder data looks like, how it is recorded, how it is decoded, and what the CSV file flying around actually is (and how it was made). Why bother putting this in here. Based on your other comments in this thread, the body of your text should stand on it's own. Perhaps to add weight and an air of authority? Since you don't actually reference any industry standards and prior work, this must be your personal opinion. One of the problems with this report is that you seem to be doing a lot of work and effort despite the fact that the major companies and bodies in this industry have already done all this work and that's why we have Standards, References, and Requirments in place since the mid 1900's. You appear to propose some industry breaking theory of error finding that all these thousands of people and billions of dollars have overlooked or not thought of themselves. Not NASA, Boeing, L-3, AA, FAA, NTSB, ARINC, IEEE, FlightScape, and the list goes on and on. Now, not everything is wrong in here, but why you didn't just take the Crash Investitgations, Enginerring Standards, and Industry Requirments already in place for the past 40 Years and shoot holes in that. The recorded flight data is serial binary data. 1 So that means the guy who sat down with Flight 77s data recorder, put the tape into a computer, a single wire as the input, and across that wire comes a series of bits: 1,1,1,0,0,1,0,1,1,0,0,1. When you 2 consider the problem of sitting at a computer, and seeing a serial stream of 1s and 0s come in, and trying to make sense of it, you will begin to realize the engineering difficulties in making this process work well. Well, the first (and most familiar) is to break up the signal into bytes (8 bytes), or other units of length (the FDR on flight 77 uses words of 12 bits in length, instead of bytes). Throughout the document, I will refer to “words” which simply means a predefined number of bits. For Flight 77, specifically, it means 12 bits, however the logic below will apply to any number of bits per word. 1,2 This is completely disengenous and is a personal attack to the people and companies that actually perform this work. Being an Engineer yourself I would think you would have more respect for the fellows that perform in this field of work. The "problem" you attempt to create is something that these companies and people have been working with for several decades. No one "sees" a stream of bits and attempts to "make sense of it". That is nonsense and for the people that actually work on this for a living it's an offense to thier efforts and achievments. You continue this for the next several paragraphs which I won't bother hashing apart for more "dopey" comments except to note some special cases. All frames are exactly the same length, with the known synch words in the exact same places. For this reason, when you are receiving data from a data recorder, you would know there is supposed to be 2000 bits between synch words, and so if the current frame you’ve received only has 1999 bits between synch words, you would know that a bit has been dropped (this happens more often than you’d think). 3 The question becomes: “Ok, we dropped a bit… but from where?” Chances are high only one of your words is corrupted (11 bits instead of 12), but 4 it’s impossible to know which one, so you are forced to throw out the entire frame. (Please keep that thought in mind when conspiracy theorists talk about “partial frames”). 3. This question does arrive, but it's easily answered by the companies that specialize in this field and specifically Boeing and American Airlines. You would be better off explaining right here about the data frame layout which would tell you exactly what is missing instead of injecting more nonsense about impossiblities. Remember, we haven't even got to the Engineering Computations yet which occur prior to a CSV or Tabular read out. 4 All frames have time stamps. Since each frame represents an exact amount of time, the recorded time of any single word can be calculated by its position in the frame and the time-stamp of the frame. If a word is exactly half way into a frame, it’s time of recording was exactly halfway between this frame’s timestamp and the next one. 4. And right here is your * great mistake. You cojoin different definitions of time in the same reference. A Time Stamp is entirely different from a Time Slot. Later on you change "word" to "data" which further the mistake. This is my critique and not my alternate presentation so I will not create another wall of text on details here. Perhaps you mean something different here, in which case you should reword it to be clearer. Another false use of "impossible" to add weight to your argument. It is not impossible and "all" of this data is never "thrown out". We are talking about the FDR here correct? Adding more wieght by not fully explaining the Frame and injected seconds for your false computations later. You continue the mistake of earlier by linking a "word" which a value for Alititude and that you can add the Time Slot to the Time Stamp for the Real World Time of the Data Event as it happened. THIS ENTIRE SECTION IS SO FULL OF MISTAKES IT BOGGLES MY MIND. INSTEAD OF COMMENTING EVERY MISTAKE IN HERE I WILL JUST UNDERLINE THEM. OMG!! I Can Not believe this is really your point of view here!! who is decoding it later will think it was measured at 0.75s. This problem is generally solved by reserving space in the data-stream for time-stamps of the data. In other words, word 3 might be for the computed airspeed, and word 4 might be for the time-stamp that the computed airspeed was measured. In this way, the actual altitude signal might be recorded at time 1.7, but the timestamp will tell us it was measured at 1.3. It’s very important to understand that when this type of data was recorded does not indicate when it was measured. You need this timestamp information to do know when it was measured. Flight 77 raw's FDR data probably has these timestamps, but the CSV file does not. You continue the great mistake right here again. The Time Stamp recorded in the Data Frame is exactly what it is. A Time Stamp for ALL records recorded in that Frame. I'm sure you'll be upset about me saying this here, but I'm just critique. I'll give source references and factual data later. Perhaps another one of those "poor software engineers" like yourself (given your "credentials") would not need to assume such things and give details and credit where it is due for things that others have already done publicly. I'm getting quite tired at this point of reading this "dopey" work. I know I should refrain from being uncilvil and unpolite but whatever. So after what ever you are doing!? Is the final attitude on the CT idiot smart-remarks video of the NTSB, the final altitude or are 3 seconds of altitudes missing? Did the aircraft hit at 5 degrees or 6 degrees, or 4 degrees. Cause at this altitude there are only a few seconds left before it hits the ground. And it does hit the pentagon. Question you could work on is how they fit the FDR to the ground? How accurate is it? And you can not use a flat on the grass attitude, the security camera is a one second camera, the plane is doing 771 plus feet per second, you will never see it on the one second parking lot camera. So there is no video proof of the angle of final hit on the pentagon. But a 4 to 6 degree impact, which the terrorist is doing, will hit the light post and hit the pentagon. No the Pentagon does not have millions of cameras, we do not pay enough taxes! did the terrorist push the nose over to 10 degrees then settle on 4 degrees into the pentagon on the final second? The main point is understanding the FDR. Just for normal people. I look at the FDR data and it supports all the other information you can gather on 9/11. Since the FDR was found in the pentagon, it now only becomes a point to argue with not so smart CT dolts who now say the planed did not crash into the Pentagon. The fact is, flight 77 did crash into the pentagon and the FDR backs up the facts. The only point for the CT movement of non truth is to find proof it did not happen. Else they need to move to fiction land. Among military aviators, the difference between Pax(passengers) and Cargo is not blurred. I wonder what circles he travels in. I have carried both. What was that all about Gravy? It was about getting you to come back to finish what you started but chose not to continue. Looks like I was successful. Good. Saves laymen like me, who know nothing about these things, the bother of understanding pesky explanations about why they're wrong. You could have saved yourself a lot of writing, though, by highlighting A-S's post and clicking on the underline button. I'm sure A-S will go right ahead and do that. If you told me to change something I'd written, without explaining why, I'd do it immediately. In the meantime, at some point will you be explaining why A-S's analysis is "tripe?" Your actions do not influence me in the least. Just because you lost patience does not mean I have chosen not to continue. Much like these people who continue to hang on my use of the word 'cargo', it is irrelevant in this thread. Your actions do not influence me in the least. Just because you lost patience does not me I have chosen not to continue. is flight 77 still airborne? Your actions do not influence me in the least. False. Action: I type a post directed to you. Reaction: you reply and say my actions do not influence you. I was bored and still a bit miffed at JDX, sorry. Wow, what an amazing bunch of nutters. I'm sure it makes the Circle-J that much more entertaining when you stand in the middle and get touched from all sides. Whatever keeps your ego afloat Gravy. There's probably a medical term for that type of thinking. so does this mean you can expain flight 77 FDR? get to a point about FDR on 77? I find it somewhat strange that you had the most to say about the "About me" section. The reason I included it is because it's customary to accompany biographies with documents in scientific literature. I know that the traditions of scientific publication aren't highly held in the CT world, but it's a habit I've gotten into. Pick up any scientific journal, flip to the end of any article, and you'll see a short bio of the author. he "problem" you attempt to create is something that these companies and people have been working with for several decades. No one "sees" a stream of bits and attempts to "make sense of it". Yes, I am describing the motivation for the standards, and explaining how the standards solve the technical challenges. I'm using a simple narrative to describe the technical challenges of dealing with this type of data. If you honestly thought I meant an actual engineer sits down with 1s and 0s and starts from scratch every time, you've utterly and severely missed the point. The purpose of this was to EXPLAIN why the standards are the way they are, and what issues they solve. You continue the mistake of earlier by linking a "word" which a value for Alititude and that you can add the Time Slot to the Time Stamp for the Real World Time of the Data Event as it happened. The Time Stamp recorded in the Data Frame is exactly what it is. A Time Stamp for ALL records recorded in that Frame. These statements are provably false. Even the footnote of the jpg's YOU posted prove that these statements are false. The implied time stamp (what you call the "time slot") does not equal the time it actually happened. That is the entire point of this document -- which you clearly are not understanding. The age of the NZ sample depends on how old it was when it arrived in the pool and how long it sat in the pool before time T-1. The source latency and transmit delay determine the age on arrival. The update rate determines the time spent in the pool before being used. It appears that the Nz is 2/64 second older than Radalt because of its implied timetag, but it could actually be much newer. That is nonsense and for the people that actually work on this for a living it's an offense to thier efforts and achievments. Last edited by Anti-sophist; 23rd October 2006 at 02:32 PM. UT, you're in the running for the monthly JREF Forums Lowest Signal-to-Noise Ratio Award. If you are capable of doing so, please proceed with your analysis of the data. do you have any real info on the FDR and explain anything? for instance, what would the altimeter error be to correct the altimerter reading at 463 KIAS, or is the FDR reading corrected for speeds in excess of placard? Since the altitude is realy PA, what was the real setting for the pentagon, like 2992 is a standard, what was the reading at the pentagon, to correct the PA for local pressure? DCA was experiencing 30.23, so the pressure altitude wouldve been -280 ft at ground level.. and Pressure altitude is always referenced to 2992 and doesnt need correction. 1) The Air Data Computers not calibrated for high speed/low altitude flight. RMackey made some good posts on this. 2) Pneumatic lag out of the range compensated for by the ADCs. Lag increases with an increase in vertical speed. 3) The last second or two missing from the FDR plots. A-S has given us great insight as to why it may be "missing"..
Also time lag associated to measurement/calculation by the ADC to when it was recorded. does this mean you can not exlpain anything about the FDR on flight 77? or does this mean you think a missile hit the Pentagon? It's nice to see JDX actually posting where people will be critical of his statements, rather than accepting them as gospel truth. Bit of a reality check might shock him back into the woodwork where he can do less harm.